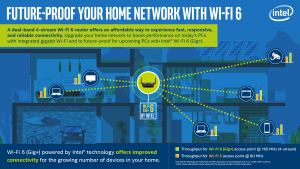 If you’re eager to get Wi-Fi 6 in your home, there’s more good news. NETGEAR just introduced its Nighthawk AX4 router, the industry’s first mainstream dual-band 4-stream Wi-Fi 6 router. 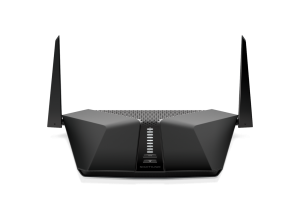 The Nighthawk AX4 is Gig+ capable and makes it possible for you to start experiencing the benefits of Wi-Fi 6 in an affordable way, offering a performance and coverage boost compared with legacy Wi-Fi 5 (802.11ac) routers. 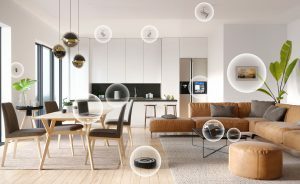 I’m also proud of the fact that the Nighthawk AX4 is powered by the Intel Home Wi-Fi Chipset WAV600 Series, which is designed to deliver fast, reliable and responsive connectivity. Our chipset was the industry’s first Wi-Fi 6 solution for dual-band 4-stream routers and is optimized for Intel Wi-Fi 6 (Gig+), which will be the industry’s first Wi-Fi 6 solution for the PC. Although you’ll see the highest-quality experiences with future Wi-Fi 6 devices, you can also get a boost by connecting Gigabit Wi-Fi-capable PCs to Wi-Fi 6 routers now. For example, 8th Gen Intel Core processor-based PCs with integrated Gigabit Wi-Fi are designed to use 160 MHz channel bandwidth so that you can get true gigabit speeds by connecting to a compatible router, such as the Nighthawk AX4. And you can rest assured that Wi-Fi 6 (Gig+) routers have backward compatibility to support your devices that have older Wi-Fi. We’re excited about how this next generation of Gigabit Wi-Fi is taking home connectivity to a new level. The NETGEAR Nighthawk AX4 will be available from NETGEAR-approved retailers starting April 2019. For more information about the router, visit the NETGEAR Nighthawk AX4 product page here.